BusyCal supports a variety of event types, including events, banners and to dos. Banner — An all-day event that can span multiple days. Event — An event with a start and end time. Dated To Do — A task with a due date that appears in the calendar and/or To Do List. See To Dos for more information. Timed To Do — A task with a due date and time that appears in the calendar and/or To Do List. See To Dos for more information. Undated To Do — A task with no due date that appears only in the To Do List. See To Dos for more information. Note: BusyCal for Mac supports additional event types, including stickies, journals, and graphics. If you add any such events in BusyCal for Mac, they appear in BusyCal for iOS after syncing. 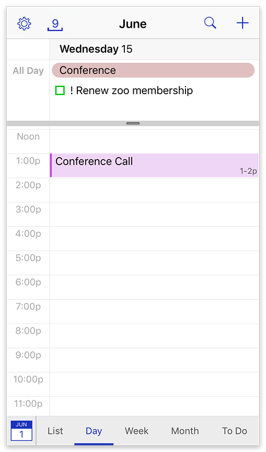 Stickies and journals appear as all-day events on your iOS device. This day has a banner, an event, and a (dated) to do.